By Dawn Devine Brown. Chock full of detailed information on how to design, construct, fit, and embellish bras and belts. 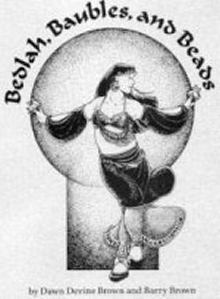 Contains a summary of the history of belly dance costumes in the 2000th century. It has step-by-step instructions for beading custom appliqués. Presents information about methods and techniques for figure-flattering styles. Presents a portfolio of styles and ideas for expanding your performance wardrobe. Also includes a list of resources and an extensive bibliography. A well-researched and clearly-written book for anyone who is making, or wants to make, a belly dance bra and belt. 132 pages, spiral bound, 8 1/2 X 11 inches.